A Desperate Tatter: Where has the time gone?? Here is is almost time for the 4th of July and where have I been? One place was to North Carolina, where my oldest grandson graduated from High School. 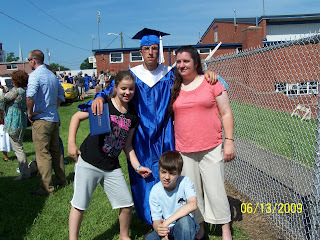 In the picture you see him, his mom in the red shirt, his sister Kyra and his little brother Sean. Now he is in Alaska with his Aunt and having a ball even though his Aunt has put him to work already. He has done some yard work, hauled logs to be cut up for winter fuel, learned how to operate the power generator, and drive a standard shift truck. He has gone four wheeling with his cousin and learned how to clean the spark plugs on the four wheeler, fishing and exploring for bears. This weekend he is helping his cousins unpack two trucks and move into their new home. They have been living in a motel for three weeks with two little girls. I wouldn't have wanted to do that! They are in the army and will be stationed at the post in Fairbanks. If they make it through the winter they are considering staying there when he gets out in three years. My sister will be home this evening from Nebraska. She will be here for a month. We will be doing some golfing and kayaking. I hope I don't tip over when I get in this year as I did last year. Also have lots to do around the place for dad. He has his projects all lined up. She will be busy. I am still working! I was about to be finished July 8th but had a email telling us to stick around until we are asked to leave. Oh well, more extra cash to pay off those pesky bill and to buy more tatting shuttles, threads and books. Just need to find some time to tat. I have several raised beds that I need to be out weeding. Have several vegetables growing but probably not enough to can in the fall. I have cucumbers, spinach, lettuce, radishes, cantaloupe, potatoes, onions, chives, beets (but I don't think they are growing) tomatoes, peppers, and asparagus. Lots to keep me busy. Good thing my girlfriend does the lawn mowing when she is here. think I will assign her the flower beds to weed too.